U.S. businesses importing goods from Mexico should be aware that crossings along America’s southern border are currently experiencing ongoing delays in the processing of northbound commercial vehicles due to the reallocation of customs personnel to support with the migrant crisis. These delays are expected to continue for the foreseeable future as U.S. customs authorities manage the continued influx of migrants. On March 27, 2019, Customs & Border Protection Commissioner Kevin McAleenan announced CBP would be reassigned approximately 750 customs officers who ordinarily support daily customs processing to instead support the ongoing effort in processing migrants arriving along America’s southern border. Initially, these officers were being pulled from southern border posts; however, beginning April 12, CBP will begin reassigning officers from northern border posts and airports, potentially affecting customs clearance times at affected locations. CBP may also reassign officers from ocean ports in May if the influx of migrants does not decline by that time. In addition, CBP announced on April 3, it would be closing the Bridge of the Americas (BOTA) in El Paso, Texas every Saturday, as well as the Nogales truck crossing in Arizona every Sunday. 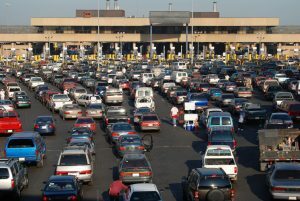 El Paso is the third-largest southern-border truck crossing and Nogales the sixth-largest. As a result of the shift in personnel and lane closures, the Journal of Commerce reported wait times in El Paso increased from about one hour to about seven. Similarly, in Laredo, the largest southern border crossing, wait times have spiked to six hours. CBP does not have any additional closure planned at this time. U.S. businesses that that are expecting commercial transports to deliver goods should check on wait times at southern border crossings via the Border Wait Times (BWT) website or BWT app to determine the degree to which their transport may be delayed.